With 64 Retro Favorites Including California Games, Winter Games, Jumpman and More! The C64 Mini, a 50% replica of the world’s bestselling home computer that launched in 1982, comes pre-loaded with 64 classic games and The C64 Joystick. Originally designed for fans of the original personal computer, The C64 Mini brings kids and families together to play some of the best games of the neon decade with simple plug and play action. Aspiring gamers of yesteryear can revisit the past or even program their own games – just add a keyboard, and The C64 Mini becomes a fully functional home computer complete with C64 Basic. 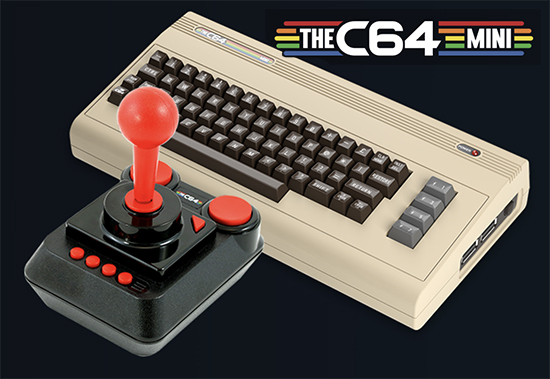 The C64 Mini is available in The United States at GameStop, Wal Mart, Amazon and Costco for $79.99 (US) and in Canada at, BestBuy, London Drugs, EB Games, and Costco for $99.99 (CAN). Pre-loaded with all the Retro Faves: The C64 Mini comes with 64 classic titles already installed, including: California Games, Winter Games, Impossible Mission II, Boulder Dash, Jumpman, Pitstop II, Speedball II: Brutal Deluxe, Street Sports Baseball, Summer Games II, Temple of Apshai Trilogy, Uridium and more. Don’t Forget to Save: For the first time, The C64 Mini allows you to easily save your progress in games. Always Optimised: The C64 Mini supports software updates via USB flash drive so players have continued access to improved and enhanced programming.